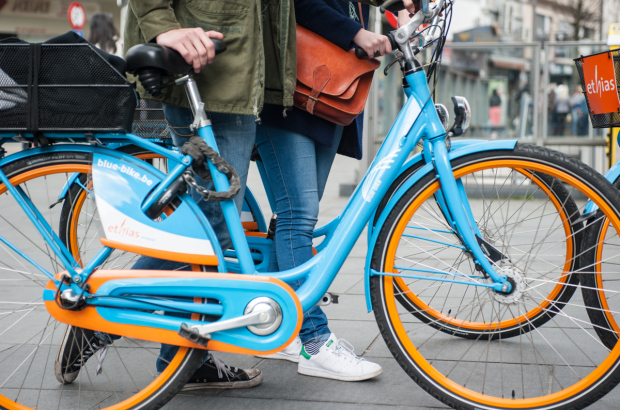 The station-based Blue-bike sharing scheme saw 30% more users in the first two months of this year compared to the same period last year, according to Blue-mobility, which runs the system. The bike-sharing system registered more than 1,000 rides in January and February compared to 772 early last year. Flemish transport authority De Lijn bought the SNCB’s shares in Blue-mobility last year and has an 84% share. It was feared that the scheme, used in cities in towns across the country, might pull out of Brussels after that, but that has not been the case. In fact, more bikes are planned for all four locations. Blue-bike differs from other bike schemes in that the bike must be returned to the transport station where it was picked up. In Brussels, that means North, Central, South and Luxembourg. The idea is to use the bike to get to and from the station when commuting or city-tripping. With Villo! to contend with in Brussels, the system has been slow to pick up steam, but the figures are now more promising. The number of return trips from North Station, for instance, nearly doubled on the same period last year – from 216 to 408. More bikes were added to North Station, which accounts for some of the success, and the same is desperately needed in South Station, where it’s hard to get a hold of one of the mere 12 bikes. Those will be increased to 24, said Blue-mobility, by next month.